Some people use the nonstandard conversate and orientate because they're trying to apply a rule that works for other noun-verb forms, such as communicate for communication, compensate for compensation, and enunciate for enunciation. Make sense? Maybe, but we're not talking about sense; we're talking about Standard English. Some ation-ending nouns go all over the place: condense for condensation, create for creation, and transport for transportation. Seeking consistent logic with English words will lead to many errors. 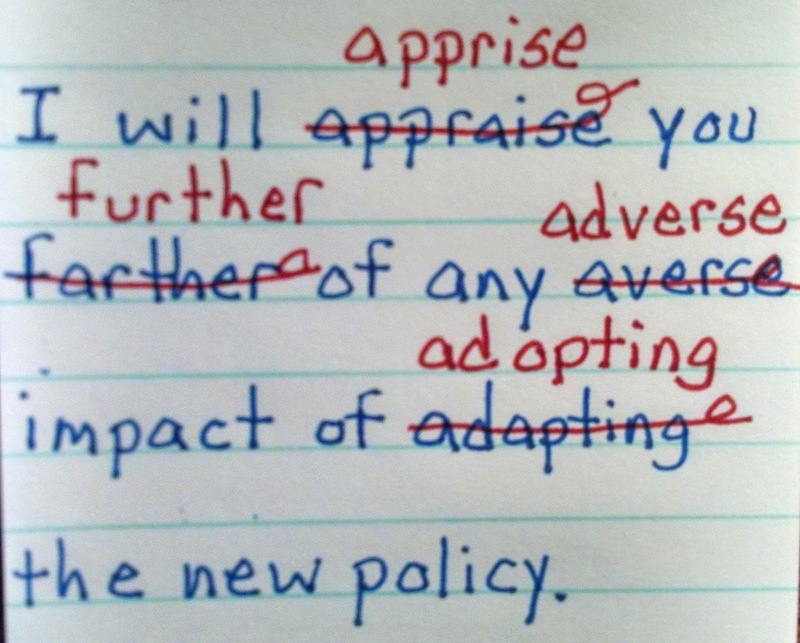 For instance, the adjective forms of many verbs may end in able (acceptable limit, notable achievement, quantifiable result), al (emotional behavior, irrational judgment, transitional government), ed (affected parties, educated woman, involved participant), d (filed document, reconciled ledger, tiled floor), ing (misleading statement, overarching point, running water), ive (automotive technology, explosive temper, informative teacher) ory (compensatory skill, inflammatory language, mandatory training), and other forms. Lots of luck trying to find logical patterns here. Here are three entirely different situations concerning misused words in English. Hopefully — The word hopefully was once an adverb, meaning it described a single verb meaning with hope (e.g., I think hopefully about the future). Now it is more often used as a sentence adverb, or disjunct, meaning it describes the entire sentence (e.g., Hopefully, I will arrive at my destination on time). The disjunct is accepted by most dictionaries. To-day — If you read old books that have not been edited in their revised editions, you will find today hyphenated. I'm old enough to remember nondisabled and nonhandicapped as hyphenated after non. (While M-W.com and Dictionary.com accept these words with out a hyphen, AskOxford.com does not as of the date of this post.) If you can read this, then you remember email written as e-mail. Once a word becomes commonplace, we often drop the hyphen. Literally — Many people use the word literally improperly in common conversation, as in the example. But if you try to correct them, they're likely to tell you to get a life. Most use it despite knowing its wrong. Some words just get misused at one point or another and become accepted in their new meaning. I admit to having using it "improperly" in speech, but I'd advise against using it in writing. Note the two diction "errors" in the image. How many people really know about the proper meaning of momentarily? I know what grammar snobs are thinking: Well, they should know. Yet I have run across people more articulate then most of those snobs who do know the difference and don't care. For this reason, I do not correct people who use momentarily for in a moment. It's a hairsplitting rule. The confusion between compose and comprise is another story. Their first syllable is spelled and sounded identically, and their meanings are close. As the note says, the parts compose the whole, and the whole comprises the parts, so this is an easy mistake to make. In fact, I see them used interchangeably so often in quality books and periodicals that some dictionaries are beginning to accept them as synonyms. You can look them up in AskOxford.com, M-W.com, or Dictionary.com. Three obvious reasons for our getting words wrong are homographs, words with the same spelling but different pronunciations and meanings (e.g., the noun lead meaning the metal and the verb lead meaning to conduct); homonyms, words with the same spelling and pronunciation but different meanings (e.g., the noun tie meaning neckwear and the verb tie meaning to fasten); and homophones, words with the same pronunciation but different meanings and spellings (e.g., to, too, two). But many other words are confusing because they are nearly homographs, homonyms, or homophones. Consider the verbs adapt (to modify) and adopt (to take as one's own), the verbs apprise (to inform) and appraise (to assess), and the adverbs farther (greater distance) and further (greater extent). 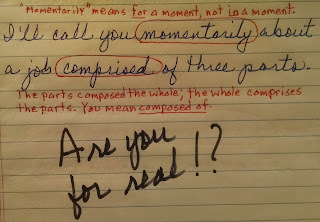 In this fifth of a ten-part series on why we get words wrong, I give a second admonishment besides the usual one about reading more: check spelling carefully, preferably leaving time between the editing and proofreading stages. You'll likely find more errors using this approach.